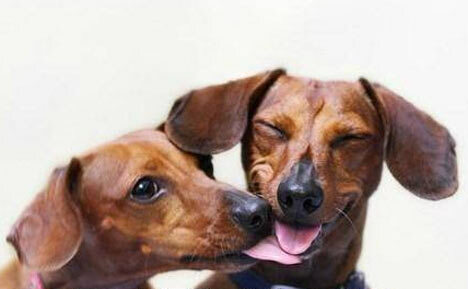 In the article, Why Do Dachshunds Love To Lick Your Face, we discover that in the wild, and during the time when puppies are weaning, they would run and greet adult dogs returning from the hunt and would lick the adults’ mouth. They would do this in expectation of the adult to regurgitate some of the meal they had just eaten (yes, this is true). Even with today’s domesticated dogs, this behavior is part of their genetics. So, one reason that the dog may be licking your face or mouth is to say that it’s hungry… or simply out of genetic instinct. Face licking in adult dogs can be a sign of respect or deference to a more dominant dog, which might be you the human in his pack. Sampson kisses me ALL the time! My mini Dixie, melted my heart when I bought him. He loves my other 4 dogs unconditionally. They all get along and all are happy.